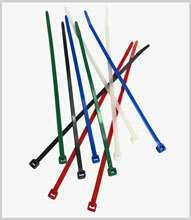 Cable ties or cable wraps are available in high grade nylon to many standard lengths/widths and in many colours. A variety of locking mechanisms are available. Packed in bulk or sets.